The SR100 Big Gun with an 18 degree trajectory is the most popular Pivot End Gun used on center pivots today. 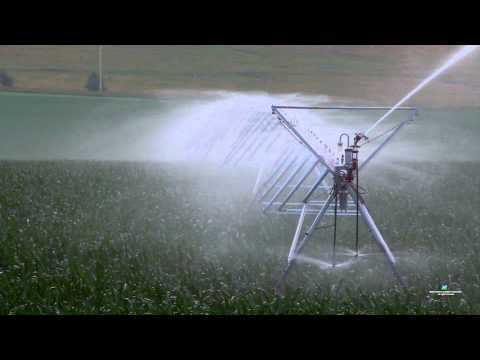 A Big Gun® sprinkler (operating through a complete rotation) on a quarter-section pivot can effectively irrigate up to 20 additional acres (8.1 ha). Considering the costeffectiveness of putting this additional land into production, an end gun alternative shouldn’t be overlooked. END GUN CONTROL — NO SOLENOID REQUIRED Winner of AE50 (American Society of Agricultural and Biological Engineers) 2001 Outstanding Innovations — the Pivot Gun Control Valve combines a Big Gun® Sprinkler and an 800 Series valve (A2 B11 C3). No solenoid is needed for this gun control system (when a booster pump is used). PRINCIPLE OF OPERATION: The Nelson 2” valve is normally closed. When the booster pump is turned on, the added pressure forces the small amount of water in the valve’s sleeve chamber back into the system, causing the valve to open. When the booster pump is turned off, the system pressure re-fills the valve’s sleeve chamber and closes the valve.